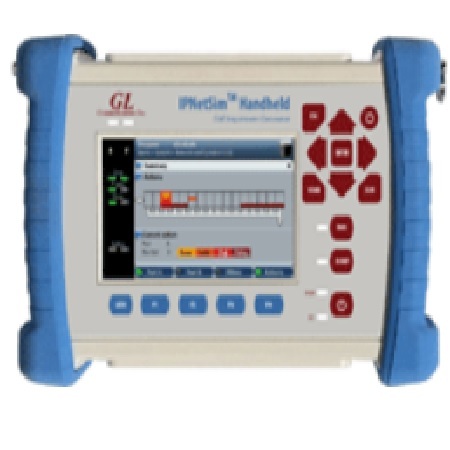 GL's IPNetSim™ Handheld is a hand-held battery operated instrument that can simulate the real-time IP and Carrier Ethernet network dynamics by means of hardware controlled packet delay, loss, jitter, errors, bandwidth limitations, congestion, and duplication. IPNetSim™ Handheld offers to manage network behaviors of up to 1 Gbps rates with accuracy always better than 1ms. IPNetSim™ Handheld is an invaluable tool for IP equipment manufacturers, R&D departments, Network Operators, ISP and Triple Play service providers that test and verify a wide variety of projects to determine whether a network application or device is appropriate for operation in such networks. IPNetSim™ Handheld is equipped with hardware based impairments generator, and dual GbE ports, to emulate the dynamics of real Ethernet / IP networks.